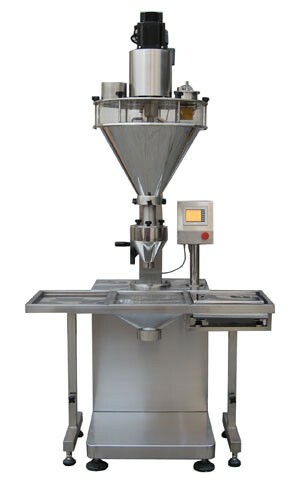 New Semi-Auto Stainless Steel Auger Powder Filling Machine FG-1B-2. To fill product with a packaging weight of 10g-5000 grams. Great for products like milk powders, spices, solid drinks, white sugar, coffee etc. Unit comes equipped with a Touch Screen Control which allows for 10 stored programs, a PLC Controller for accurate weighing and a Servo Motor Driving Screw. Packaging accuracy of +/- 0.5% - 2% depending on product being filled. Speeds: 15 -60 per minute depending on the size of fill and type of product. Comes with a 70 Litre Hopper. Electrics: 3Ph/60Hz/220V. Overall Dimensions: 46”L x 29”W x 88”H. Delivery Time: approx 8 weeks from receipt of 65% Deposit.